Otley Pub Club, the town’s community group who support and promote Otley’s pubs, have written to Star Pubs and Bars, Heineken’s pub company, to oppose their wholly inappropriate and destructive plans for two historic Otley pubs, the Black Bull and the White Swan. Heineken/Star are proposing totally unsuitable refurbishments to both pubs, despite them both being Grade II listed buildings in the Otley Conservation area. Heineken acquired the pubs alongside three others in Otley when they bought a block of 1900 pubs nationally from fellow giant tied pubco Punch Taverns in 2017. They had no knowledge of the pubs at the time. The acquisition made Heineken the largest pub owning company in Otley with 6 pubs in total. The computer-generated image of the 16th century Black Bull has caused outrage, with the fine historic frontage ruined and the heritage signs destroyed in place of modern ‘steakhouse’ stencilling. Ludicrously for the oldest pub in Otley, Heineken/Star intend to “reposition The Black Bull as a modern, stylish pub”, rather than celebrating and promoting the ancient heritage and genuine history of the pub. 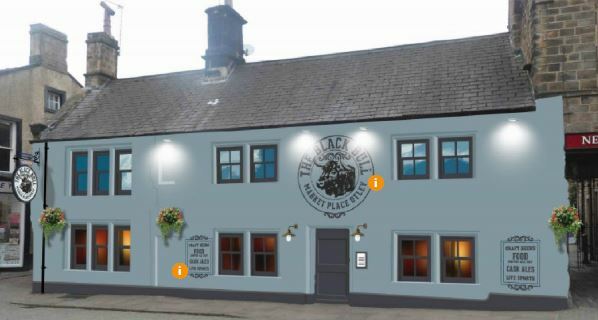 The plans for the White Swan, a traditional pub (much of which is estimated to be around 250 years old), involve ripping out the appealing multi-room interior and ridiculously replacing it with “industrial style furniture, contrasted with softer botanical features and finishes to turn the pub into an attractive space with a trendy, city-centre feel”. This is an absurd attempt to turn this popular historic traditional listed pub local into a young person’s venue and dining pub, even though experts and the current landlord are adamant this would fail in the building leaving the pub empty and threatening its future. The history of both these pubs is listed on the Otley Pub Club website, the Black Bull here http://www.otleypubclub.co.uk/otley-pubs-present/the-black-bull and the White Swan here http://www.otleypubclub.co.uk/otley-pubs-present/the-white-swan. The plans for both pubs also include wholly unrealistic turnover levels, considering the competition in Otley with many pubs, bars and restaurants. This means that there is a very high likelihood of tenant failure and damage to the long-term trade for both pubs. We also note that even though the tenants themselves will effectively pay for the cost of the refurbishment through the rent and drinks prices (the artificially inflated tied price system operated by Star and the other large pubcos operating tied leased pubs). Due to the refurbishment they then intend to deny tenants their right to the free-of-tie Market Rent Only option for seven years. This suggests to us that the real motivation is to seek higher and unreasonable rents to and avoid MRO, rather than as claimed to ‘improve’ these pubs. We are clear that far from doing so the risk is of ruining them and in the case of the White Swan, would certainly do so). Otley Pub Club have written to Heineken/Star asking to meet with them in Otley and to cancel their inappropriate plans and either come up with appropriate plans to retain the historic character of both pubs or to sell them. Otley Pub Club are sharing the letter and their serious concerns about these two pubs with local councillors, Otley Town Council and Otley Conservation Task Force, a local organisation who seek to preserve the historical architectural heritage and integrity of the town. They are also alerting English Heritage (Historic England) and SAVE, with both pubs being listed and the two local CAMRA branches and the Society for Preservation of Beer from the Wood West Yorkshire Branch. “We urge Star/Heineken to put these dreadful plans on hold and meet with the community and the excellent sitting licensee of the White Swan to discuss how they can and should work with him to keep the pub as it is respecting the will of the community and regulars”. “The plans for these two historic pubs are appalling and akin to the kind of corporate vandalism seen back in the 1970s and 70s when large brewers ripped the heart and character from so many historic pubs. What’s so disgraceful about Heineken/Star’s plans for the White Swan is that the pub is successful, with a very loyal clientele, all of whom would be alienated by these awful plans”.